What good is engineering research with no practical relevance? I am a Ph.D. student currently doing research at a top engineering school in North America. I am becoming more and more jaded at the fact that a sizable portion of the research conducted at my university as well as publications to engineering conferences seem to have very limited practical relevance, and with no attempts to address implementation concerns. Many of these papers seem to be published just for the sake of it. One glaring example is power engineering. The methodologies proposed by recent graduates from power engineering are so extremely far-fetched from practical implementation, it raises the question as to why any such research should be continued. Power is a very safety critical field: people can die after going for too long without power (case in point), and the industry itself is highly government regulated. The algorithms that have been proposed from my research department as well as many like it completely ignore things like safety guarantees. Furthermore, it is highly unlikely that government employees in the power industry would rely on some biology motivated or learning based algorithm to arrange the power supply to millions of actual people. There are decades old well-regulated power markets for that! But power is just one example out of many. I have read many papers on signal processing and control theory. Most of the papers are completely math and proof based; their proposed methods are so mathematical, with extremely limited robustness or safety guarantees, etc. These researchers are more concerned with epsilons and deltas than how their proposed methods can be realistically implemented in people's cars or mobile phones. An "implementation" nowadays is just a MATLAB simulation, a few equations, and a graph. Even during undergraduate engineering training, we have seen how difficult it is to go from simulation to actual software/hardware that people can use. I can easily show you highly technical papers from these fields published by people who do not even care about the readability of their notation, let alone practical implementation. So it is a legitimate question as to why anyone would ever use these highly-theoretical, and assumption laden research results. It is unclear what "the small-gain signal must belong to a Hilbert space on the extended half-line" actually means in real life cache design. Furthermore, many papers are completely without any mention of practical implementation of the algorithms, so it is completely unknown if anyone would actually be able to use these research results. Engineering research is ultimately used to create new technologies that promise to improve the lives of people. However, it is unknown to me at this point how a "bat-echolocation based meta-heuristic algorithm for nuclear generator dispatch" could benefit anyone. So my question boils down to how we as researchers should attempt to bridge the gap between the highly mathematical, highly theoretical modern engineering research and the practical implementation of research results. What good is engineering research with no practical relevance? The short answer to your question is that you are vastly overestimating your, and other engineer's, ability to judge what techniques will ever have practical relevance. I think it was Michael Stonebraker, a Turing award winning computer scientist with no lack of practical impact, who said that the sweet spot for academic applied research are techniques that are about 10 years away from being widely implementable. If you limit yourself to things that you can already do today, you will fail to propose the kind of radically new developments that should, at least in theory, distinguish academic research from other drivers of innovation, such as startup companies or industrial R&D. Incidentally, if the lack of impact your work has right now is distressing you, you should ponder the question whether you would not achieve higher job satisfaction in a startup or industrial lab. I find your example of self-learning power grids particularly unconvincing. If we rewind time a few years and relate your arguments to research into automated driving, I am sure you will find plenty of people who found this research to be a waste of time. Driving surely is a safety critical field, and automotive is highly regulated. Algorithms for automated driving assistance completely failed to, and to some extent still fail to, address the practical concerns of many stakeholders as well as governmental safety guarantees. And yet here we are. I am not sure if the same will happen to power grids, but it is absolutely plausible that it will. 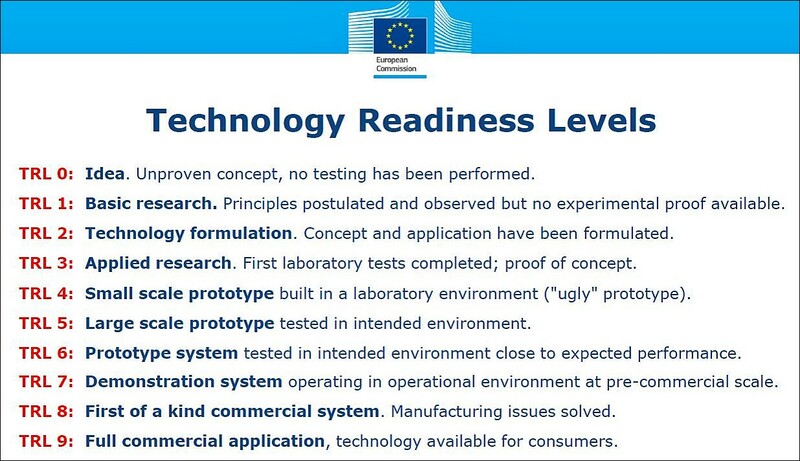 You may also be interested in reading into TRLs (technology readiness levels), as used for instance by the European Union's framework programmes as well as NASA. The basic concept here is that academic research is usually best suited to bring ideas from TRL 0 or 1 to 3 or 4. The "Matlab implementations" you complain about may very well just be the laboratory tests that are meant on TRL 3. This is very much in line with the position in the grander scheme of the progress of technology that many large organizations envision for academic research labs. Things with "no practical relevance" are not necessarily useless. They may just be "waiting for their time." For instance, the phenomenon of ionic liquids was first discovered in the early 1900's, but they didn't catch on economically or industrially until the early 2000's when they were "rediscovered" and brought to prominence as "green solvents." So it's probably unfair to say something has no possible practical relevance. It just might not be obvious yet where they could be used in the future. Research which shows new methods does not have to demonstrate the practicality of the new methods to be useful. An example from something that can be very applied is research in numerical solvers for ODEs. The vast majority of methods which have been created are not used in production-quality ODE solvers. They just aren't efficient. But having a comprehensive literature to pull from can be really helping when trying to learn about the possibilities. Someone outlining a method which isn't very efficient might've contributed new ideas for how to adapt to a certain case that in the future someone else can use to create something that is actually practical. And having a publication which implicitly highlights "look, this thing really only works in special cases because of X" helps someone else in the future when they have that idea (it's much quicker and easier to read a paper and go "okay, that doesn't work as well as I'd hoped" instead of building it yourself). This also relates back to publication bias. Publishing that something doesn't work is just as valuable as publishing that something does work. Of course, modern publication practices require "significance" so generally researcher have to be sly about how they write the abstract ("we find that in conditions X, Y, Z that this method may be more efficient than current standard choices"), but it's pretty clear from the paper what it actually means in practical terms. In the end there's a wave of information that moves forward and almost accidentally stumbles upon ideas which work, and these stick and become used in industry. Meanwhile, research continues onward to see what else it can find. Pseudo-applied science is often a waste of resources. This does not mean that fundamental or basis research is pointless, but there is a difference: Having an abstract model for something "out of reach" can be fruitful - one can study it, and add more obstructions in the future. But there are seemingly applied models which draw an unnecessarily amount of attention. They are either too simplified and already well-understood so that you should move on to more realistic models or they make totally unrealistic assumptions which allow you to apply a method that would otherwise be infeasible. In both cases the models "survive" in the community because the number of scientists is large enough to form a "peer review group" so that papers get published. Summarized: Fundamental research is helpful, but beware of constructing "applied models" that do not have applications. I think the other answers look at the question in one way, but I'm going to answer it from a more 'human' perspective. Most people do research because what they're researching interests them. They're not trying to make millions (quite the opposite usually - they're often not well paid); they're not trying to change the world (even if they do so later); they're just really interested in if XYZ is possible. The fact that sometimes you get something really ground breaking from research that changes how the world works means that companies are willing to invest in the research; but on a personal level, if you're not interested in doing the research, then there's not much point in doing it. A lot of research is currently impractical and theoretical. But that's why lots of it is university research rather than commercial R&D. And sometimes it becomes very useful, eventually. When semiconductors were discovered back in 1821 no one in their wildest dreams would have realised what an impact they would have. And Lasers. A great idea to shine a coherent single wavelength light at something: but why would you bother? And they required expensive materials which ruled out every day use. Then semiconductor lasers were discovered. And then fibre optics, which need a coherent single wavelength of light to make a data signal go far. So now all the internet runs over fibre-optic cables fed by tiny cheap lasers, totally revolutionising everything, due to pure research which sounded very unlikely to yield anything useful about 70 years before. The construction of normal bases of a finite field extension is "far-fetched from practical implementation". It has "very limited practical relevance, and with no attempts to address implementation concerns". Moreover, it is "so mathematical". "It is a legitimate question as to why anyone would ever use these highly-theoretical, and assumption laden research results." This all is very true. Or, better to say, was very true. In the past. Until you suddenly had the Massey-Omura cryptosystem. The fact that it has no application, or proper implementation right now does not mean it will never have one. Who ever used those theoretical things called Riemann manifolds in actual real life? Good thing they were there already by the time Einstein worked on his general relativity. Theoretical research is there, so that at one day someone else can pick it up and use it. Why does anybody study drugs on animals? We don't care about healing lab rats. But we hope that helps us study drugs on humans. Similarly, the goal of solving problems in oversimplified settings (lab rats) is often to help solving those problems in more realistic settings. Lots of research is not targeted at direct application, but at other researchers. This is a feature, not a bug, because researchers need to build on something. The path from a paper to its application does not need to take a single step. Also, not all of the theoretical papers need be applied. Some of those theoretical results aren't good enough to be applied, and you can tell from the paper itself—more theoretical work is needed before they're worth applying. Sometimes, even when you know where you want to get, but you have no idea of the path, going in somewhat random directions at the beginning is more effective than targeting the destination directly. (Saw a keynote about a formal study of this in optimization problem). In a neuroscience class, we discussed how models help understanding the brain. A researcher taught us compellingly that the virtue of a model is not (only) in what it includes, but in what it leaves out. We can't understand a full model of the brain; but we can study oversimplified models to see how they behave, then check if what we learn applies on more realistic models. It also turned out that oversimplified models of the brain are useful as artificial neural networks. Some of the papers you have seen start from unrealistic assumptions. Likely, that's to simplify their study, especially if it is a mathematical study. Papers in slightly more realistic conditions come afterwards. While I don't study engineering myself, I study computer science (programming languages), and we also have many papers which consider simplified scenarios—many of those papers are still indirectly relevant, though it can take decades before theory becomes usable in practice. EDIT: since you ask/question relevance/applicability: I'm thinking of mathematical papers which are motivated (implicitly or explicitly) by the goal of making programs less buggy. Lots of progress relies on doing more math of extremely abstract sorts, but going from math to more math to prototypes takes few stages. PhD research is almost by definition part of the education process, rather than part of a product development process, thus the work will appear to have little direct practical relevance. A similar aspect can happen in industry itself where some of the applied research is directed at the latest buzword aspects, often without a clear understanding as to whether the research will bear fruit (i.e. directly, this year). More usually the work will fall away and become part of the researchers education (just like the 9 out of 10 start-up entrepreneurs). Knowing if the work will have relevance is hard, but the learning will be useful. I have current work based on 'failed' AR work from 10 years ago.. Remember, feedback control was an invention (H.S.Black) which no-one believed, so some ideas do have their day. Boole was long dead before his (silly) ideas in logic came into fashion. You never know when research with no practical relevance will suddenly become relevant. A recent example in my field (astrophysics): The BICEP2 results that initially stated they had detected a signal attributable to rapid inflation of the early universe. If this signal proved true, these people would likely have won a Nobel Prize, just to give an idea of how big of a deal this was. However, others recognized that the cosmological "signal" likely could be completely attributed entirely to interstellar dust floating around in the Milky Way. Almost overnight, astrophysicists who specialized in interstellar dust became the world-experts of cosmology. Their research (which I will admit was important and applicable in its own right, so not an exact parallel to the OP's question) all of a sudden became incredibly relevant and important. Another example is Einstein's theory of General Relativity. Although an incredibly amazing theory in its own right, and extremely useful for understanding the universe, its applications to more "real life"-type situations were for many decades basically non-existent. That is, until GPS was developed. Without accounting for General Relativity effects in GPS measurements and calculations, GPS measurements of positions would quickly become very incorrect. "Errors in global positions would would continue to accumulate at a rate of about 10 kilometers each day!" So decades after a theory was developed, technology finally advanced to a point where the theory became practically relevant in first the military and then our daily lives. These examples aren't perfect parallels of the situation the OP describes, but still serve to illustrate my original point: you never know when research with no practical relevance will suddenly become relevant. Research is a vast domain where expectation of solution to any particular challenge or inventing a new methodology doesn't come over night. A fully fledged commercial product available is not one scholar's Research Paper published . It's an integrated study , Work of many scholars for decades. The best any knowledged person can do, is to present his contribution on his domain in any medium . With his/her contribution can make a remarkable resource not only in the same domain, sometimes in others too. Sometimes a technical paper can be an inception of new revolutionary technology or ground breaking benefaction for the existing technology. Here the contribution is important than the requirement. Technology is a result of unexpected revolution. There shouldn't be scarcity of resources. Hence abundance of research is going on across the globe in multiple domain as the key for future or present innovation . Everyone's knowledge is precious and valuable. This knowledge cannot be shared through mouth , but only through technical papers for the present and future generations. When any new break through happens , the resources should be ready to serve the purpose. How far is it from flying a kite in a thunderstorm to building a lightning rod that can protect a barn? Ben Franklin did both. How far is it from Claude Shannon's paper on digital encoding of signals to the now familiar audio CD? It seems to me that basic research has to ask questions, even when it's not clear how the answer will be of benefit. Sometimes, the research turns out to be science research instead of engineering research, as in the kite example above. But you get the idea. Perhaps applied research is more down your alley than basic research. "Usefulness" is about perspective and perception. In my own little office cubicle maybe it is difficult to see where exactly my research results fit in. Just try and find confidence in that there exist (more or less visible) visionaries "high up" in different aspects who see where it will fit in. The bad thing about religion being so bashed and marginalized these days is that the concept of faith in things larger than us loses significance while in practice it is more relevant than ever. Maybe not in an almighty God, but in the existence of people making plans outside of ones' own perspective. Not the answer you're looking for? Browse other questions tagged research-process industry academic-life engineering electrical-engineering or ask your own question. How important is mathematics in engineering research? Are there hacks or smaller scientific search engines offering you context-sensitive/semantic search? Is a paper that takes existing techniques to solve a practical and more specific problem valuable enough to get published? Getting into a topic one is barely familiar with? Does building an app or software system count as computer science research? My PhD research has a negative outcome — how can I still graduate with it? Fear of missing out: how to maintain a good attitude towards research in academia in the age of rapid commercial success coming from industry? PhD in theoretical physics: good or bad for engineering jobs?